Yeah, but: It's safe and unsurprising. 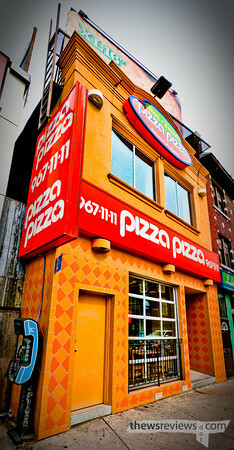 The Long Version: Pizza Pizza is the McDonald's of the flat-meal world. It's predictable, it's consistent, and it's not exactly famous for its fine cuisine. It was a staple of my high-school nutrition plan, but once I finished grade fourteen, we drifted apart. I started ordering entire pizzas, and almost always from other restaurants. It wasn't a conscious snub; more of a life change. But during Toronto's one recent attempt at winter storm, the intersection of Spadina and Harbord was just too far to walk, so I hit the Pizza Pizza at Bloor and Spadina instead. I got the 'all meat' pizza slice, since it was the one with the least-glassy cheese and didn't have curled edges. I was surprised - it was slightly cheaper than I expected, much smaller than I was used to, and not very good. In the interest of fairness, I went back a second time for the gold standard of pizza takeout, the pepperoni slice. I wasn't overly impressed with it, either. 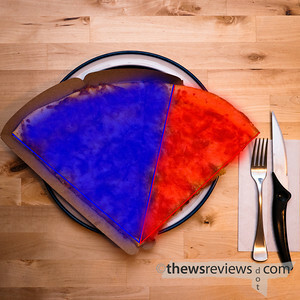 Pizza Pizza uses cute little trays for its slices, while the two at Harbord use paper plates. Just for fun, I put a slice from Papa Ceo's on top of the Pizza Pizza tray - the red shows the part of the pizza that you don't get from the chain store. The one big thing that Pizza Pizza does have going for it is that it has a great track record on the City of Toronto's Dinesafe website. Papa Ceo doesn't have a spotless record, and the whole rat carcass thing has put me off of Cora's for a while. Pizza Pizza is nothing to get too excited about, but that works both ways and isn't always a bad thing. After all, if I wanted really good pizza, I'd be calling Regina's anyway.